The year’s hottest read is out, and it barely has any words in it. Los Angeles optical design company l.a.Eyeworks is known for its fabulous frames, progressive marketing, and gorgeous ad photos by Greg Gorman. It’s this last part that’s glorified in the new book FRAMED: Greg Gorman for l.a.Eyeworks, which is a collection of Gorman’s iconic photography for the brand. Currently on sale in-store only and online for $50, the 192-page tome features starkly gorgeous black-and-white portraits of some of the past decades’ most famous faces. 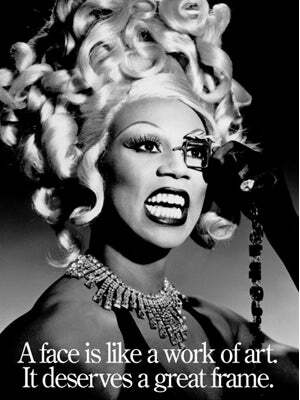 From Andy Warhol to Ru Paul, Grace Jones to Debbie Harry, a who’s-who of the celebrity world have donned a pair and worked the camera for l.a.Eyeworks. The striking collection of portraits in FRAMED will please both photography aficionados and pop culture junkies alike. To quote the tagline of the campaign, "A face is like a work of art. It deserves a great frame," and this book provides just that for these iconic faces. When: Now, until stock runs out. Where: l.a. Eyeworks, 7407 Melrose Avenue (at North Martel Avenue), 323-653-8255; 7386 Beverly Boulevard (at North Martel Avenue), 323-931-7795); available online here. Photo: Courtesy of Linlee Allen.